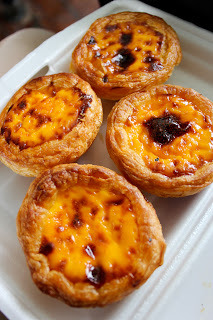 Portugese Egg Tart 葡撻 is not really a HK traditional snack. It is introduced from Macau around 10 years ago. (Portugal introduced it to Macau in the old days) It is a sweeter version of HK style egg tart and the taste are somehow different. I guess because of the different type of sugar. You can find this in the ''Macau Tea cafe'' 澳門茶餐廳 for about $7HKD.